The vast majority of our new students apply for fall admission, but it is also possible to start in January (our intensive one-month mini-term). Eckerd College has two application options: Early Action or Rolling Admission. Both programs are non-binding and do not require a decision from you until May 1. For students currently in secondary school or who have graduated secondary school, but have not attended a college or university. Certified, true copies of your secondary school records and corresponding national or provincial examination certificates. If official records are not in English, send a certified translation in English in addition to the official records. Native English speakers: If you are a citizen of the United Kingdom, the Republic of Ireland, Australia, Canada, New Zealand, or other countries where English is the official language AND do not fulfill any of the above requirements, please contact our office at admissions@eckerd.edu. For students who have attended a postsecondary institution after graduating from secondary school. Transcripts from international universities must be evaluated by an outside credential evaluation agency such as WES or Josef Silny & Associates. Students whose first language is English will be exempt from this requirement if they have completed two semesters of university coursework in English. Our annual Festival of Cultures is just one part of life at Eckerd College for an international student. In order for you to receive your F-1 student visa for study in the United States, you must demonstrate proof of financial support for your studies. Your I-20 will not be issued until you are able to provide this information. If you have any questions about these next steps, please contact the Office of Admission. Statement of Financial Responsibility and I-20 Form – this form must be submitted to us for I-20 processing. You cannot submit the College Board or any other form in place of this. A bank statement from your or your parents’ bank with the amount available listed. If this is in another language or a denomination other than USD, please make sure the type of currency reported is clear on the statement. A letter from the bank on bank letterhead indicating the amount your family has available to support your education. Once we have received the Statement of Financial Responsibility and I-20 Form as well as your supporting bank documents, we will review your documents to ensure we can issue you an I-20. After this is confirmed, you are able to submit your enrollment deposit when you decide to enroll at Eckerd College. This enrollment deposit of $400 confirms your position in the incoming class, and we will then issue the I-20 necessary for your studies. You will receive further communication about the I-20 and scheduling your Embassy appointment soon after. Why is the cost on my I-20 and the listed cost of attendance different? You must show your ability to cover all expenses paid to the institution you plan to attend as well as any incidental expenses. The I-20 cost includes what we estimate you will need for one year of study at Eckerd beyond the tuition, fees, room and board paid directly to the institution. The listed cost on your I-20 will be approximately $5,000 more than the cost of attendance. When you make your appointment at the US Embassy, you will be asked to demonstrate that you can support yourself for one year at the institution you plan to attend. Your I-20 form will indicate any scholarships Eckerd has offered you, but you must be able to show that you and your family can provide the remainder of the funds needed. What degrees are offered at Eckerd College? Eckerd College is accredited by the Commission on Colleges of the Southern Association of Colleges and Schools to award the Bachelor of Arts (BA) and Bachelor of Science (BS) degrees. 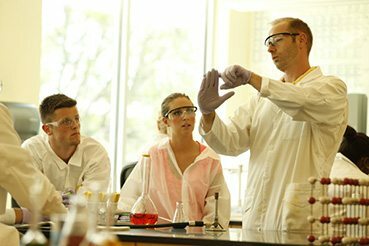 The American Chemical Society certifies Eckerd’s BS degrees in Chemistry and Biochemistry. A complete list of the major and minor undergraduate programs offered at Eckerd is available on the Academics page. Eckerd does not offer graduate level programs. What is a liberal arts undergraduate degree? Liberal arts (abbreviated for liberal arts and sciences) is a program that emphasizes critical thinking, analysis, and communication skills throughout a student’s program. Students in the liberal arts and sciences may major in any subject and will be provided with opportunities to further develop written and oral communication skills, an ability to analyze and synthesize information, and to think and respond critically to issues in their field. Students who attend liberal arts colleges will take many courses outside their major to broaden their education and encourage cross-disciplinary answers to complex questions. A liberal arts degree is excellent preparation for both career aspirations and advanced study in graduate school. Students who do not hold US Citizenship or who do not hold a green card are considered international students. If you have dual citizenship with the United States and another country or if you are a US national studying in another country, you are considered a domestic student for application, admission and financial aid purposes. Can I study intensive English at Eckerd? If you are interested in studying intensive English for academic or business purposes, please refer to information on the ELS program on our campus. Eckerd does not offer remedial English language courses for international students. All students enrolled in the college will have met our English language requirements prior to admission. Does Eckerd have international student advisors? Yes, once a student enrolls at Eckerd College, s/he will work closely with Olivier Debure, the Director of International Student Services. How do I get to Eckerd College? Most major airlines serve Tampa International Airport, which is easily accessible by highway (I-275), about 20 miles from the campus. The St. Petersburg-Clearwater International Airport is about fifteen minutes from campus, but serves a limited number of airlines. Transportation is easy from both, but Tampa International Airport is recommended. Detailed directions to campus are available on the Directions & Map page. Do I need to know what I want to major in before I arrive on campus? What if I change my major? You do not need to know your major before arriving. You work closely with your faculty mentor to build an academic plan that matches your interests. You work with your mentor all four years to decide on a major, select courses, investigate opportunities in research and internships. If you change your major, your faculty mentor will help you chart the next steps to achieve your academic goals. Yes, all students are required to have health insurance at Eckerd College. Full-time students are covered by the Basic Accident Benefit at no charge; this coverage is in effect for the 9-month academic year. All full-time students are automatically enrolled in the Hard Waiver Accident & Sickness Plan (International Students: $1,344 – subject to change) and can only waive out the coverage by providing evidence of comparable coverage. The Hard Waiver Plan expands the accident and sickness benefits to 12-months; the cost of the Hard Waiver Plan is billed to the student’s account. Specific information about Health Insurance can be found on the Bursars website. Yes, Eckerd guarantees housing for all years of a student’s study at Eckerd College. Yes. Eckerd College is located in a safe residential area. With the majority of our campus surrounded by water, there is only one way in and out. Gated and staffed 24 hours a day/7 days a week, students are provided with a safe and carefree environment in which to live, learn, and work. What is the campus plan for inclement weather? The Eckerd College Emergency Management Group has emergency plans and maintains a website with detailed information. Throughout the tropical storm season, which officially runs from June 1 to November 30, Eckerd maintains this site as a service to the members of our community. We invite students, faculty, staff, trustees, and their families to use this site as a resource for planning and information. Information about storm preparations, College closure and re-opening, cancellations and rescheduling, evacuations, and other storm-related matters are posted on the Campus Safety Emergency Preparedness site. Do I need to take the TOEFL if English is my native language? To meet Eckerd’s English proficiency requirements, you must have a score of at least 79 on the TOEFL internet-based exam or an overall band score of 6.5 or higher on the IELTS. Other ways to prove English proficiency are listed in the applying section. No. International students are not required to take the SAT or ACT. If English is not your first language or you have not been in an English-taught (or bilingual program) for secondary school, you are required to submit TOEFL or IELTS scores. If English is your first language or you have been in an English-taught (or bilingual) program for secondary school, you may submit a graded essay in English of at least 650 words. All students who plan to participate in varsity athletics are required to take the SAT for NCAA eligibility. Do I need to take the TOEFL/IELTS for admission? If English is not your first language or you have not been enrolled in an English-taught (or bilingual) program for secondary school, you must submit a TOEFL or IELTS score for admission. What is your required TOEFL/IELTS score? Please note that students who score a minimum of 550 on the Evidence-Based Reading and Writing section of the SAT are exempt from taking the TOEFL. Do I have to take the SAT II? No, Eckerd does not require the SAT II subject tests for admission. You can apply online using the Eckerd College Application or the Common Application. Please review the application requirements and process at the top of this page. For more questions about your application, please contact the Office of Admission. How soon will I find out if I've been accepted or not? How will I be notified? You will be notified within 3 weeks of receipt of your completed application (including all supporting documents) of your admission decision. Your admission decision will be sent to you in a PDF file to the email address you give us upon application, and a paper copy of this letter will be mailed to you shortly after. There are two ways to apply to Eckerd – Early Action and Rolling. Starting December 1st, Eckerd will begin reviewing applications submitted in the Rolling Admission pool. We will review and return decisions as applications become completed. We typically return a decision for our rolling applications within 4 weeks of a completed application. Rolling Admission allows students to submit applications to other colleges and does not require an enrollment deposit from the student until May 1. There is no deadline for Rolling Admission but we recommend you complete your application at least three months in advance of the term you plan to attend to give adequate time to process your paperwork. Can a student enroll mid year? Students may apply for a January start date (Winter Term). How do I confirm that I plan to attend Eckerd? Information on confirming your attendance at Eckerd will be sent in your admission packet. Students are required to submit a US$400 deposit to secure their position. You will be given a web link in your admission letter that details how to make your deposit online. You can also submit your deposit via wire transfer, check in US dollars, or by credit card over the phone. Do all documents need to be submitted at the same time? No. Eckerd will hold materials for you until your file becomes complete. What is an official document? What is the Official Bank Statement? Official documents are generally sealed original records of a student’s secondary school record (transcript) and test scores. An Official Bank Statement is required of international students seeking admission. Students should submit either a copy of the latest family bank statement showing what funds are available for a student’s study at Eckerd or a letter on bank letterhead should be provided that details the amount a family can contribute to a student’s Eckerd education. Can I submit photocopies of my documents? Photocopies of documents are discouraged. We can make a preliminary review of your application with photocopies but must receive original documents before we can release a decision and/or I-20. Will your office understand the grading scale/transcript from my current/former school? Yes, Eckerd reviews hundreds of applications each year from students at a variety of institutions. Does Eckerd offer conditional admission? Eckerd offers conditional admission to students who meet all requirements except the demonstration of English proficiency. If you meet all other requirements, Eckerd will offer you a conditional admission with the condition that you provide proof of English proficiency before we are able to offer you a full admission, potential scholarship, and I-20 for your studies. What should I do if I am an international student transferring from another college or university in the United States? A student holding a SEVIS I-20 issued by another institution will have to file a Transfer-Out Form. This form is to be filled out by both the student and the International Student Advisor in order to have the student’s SEVIS I-20 number released to Eckerd College. If the student’s visa has expired the student must re-apply for a student visa. Please note that students transferring from one institution to another will not be required to pay the US$200 SEVIS processing fee (I-901). You will also need to submit a Dean’s Report from your current institution, transcript of all college work attempted, and a letter of recommendation. You may request a preliminary evaluation of your transfer credit online. Can international university/college credits transfer? Each applicant’s file will be reviewed on an individual basis and the registrar may award credit for previous international university/college work. How much will Eckerd cost? What other costs do I need to prepare for? Do you offer scholarships? How do I apply for scholarships? 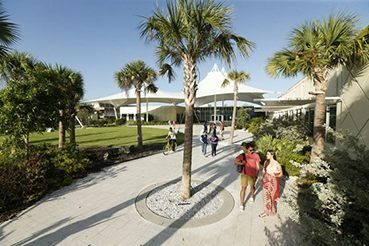 Eckerd College automatically considers international applicants for an International Student scholarship of up to $20,000 (annually) based on the transcripts submitted an admission application. All admitted students are considered for these scholarships based on their application for admission, and no additional application is required. Students transferring from another university within or outside the United States are eligible for a Transfer Scholarship of up to $15,000 per year. *Unfortunately, Eckerd College does not offer any need-based aid to international students. Am I eligible for athletic scholarships? Athletic scholarships are awarded through the Athletics Department. Please contact the appropriate coach to discuss athletic opportunities at Eckerd. How do I get my F-1/Student Visa? 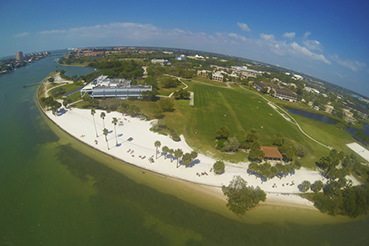 Eckerd College will provide accepted international applicants with a SEVIS I-20 (Certificate of Eligibility for Nonimmigrant (F1) Student Status for Academic and Language Students). Applicants for student visas should generally apply at the U.S. Embassy or Consulate that holds jurisdiction over their place of permanent residence. In addition to a SEVIS I-20, you will need the following documents: Evidence of financial ability to meet expenses at Eckerd College, a valid passport, Form DS-158 (Nonimmigrant Visa Application), Photographs, and Applicable fees. Applying for a student visa is a lengthy process and this should be taken under consideration when deciding when to apply for admission to Eckerd College. *Please be advised there is now a US$200 SEVIS processing fee (I-901). This fee will be paid directly to the Department of Homeland Security and NOT to Eckerd College. Payment can be submitted by mail, paid online at www.FMJfee.com or through Western Union. Please visit www.ice.gov for more information on this new fee. The F1 student visa is a nonimmigrant visa which allows international students to enter the U.S. with the intent to study full-time at a college, university, or ELS program. Can I work off campus on my student visa? Students with F1 visas are not allowed to hold off campus jobs their first year unless permission is granted by the INS. Students are able to work off campus after the first year of study. Please inquire further with Director of International Programs. Can I work on campus with my student visa? Yes, limited opportunities are available for a student to work on campus through Work Study or Student Assistance. Please inquire with Career Services once you arrive on campus about these opportunities. An I-20 form is the official government document which certifies, on behalf of Eckerd College, that a person is eligible to apply for an F-1 student visa. The I-20 issued once students are accepted to our program and is then used to apply for an F-1 visa at a United States Embassy or Consulate in your home country. Details about the I-20 and F-1 Student Visa process will be enclosed with your admission letter. How do I get an I-20? When will I receive my I-20? Eckerd issues an I-20 after a student has submitted their US$400 deposit confirming their attendance at Eckerd College. You will receive your I-20 via UPS, FedEx, or other courier service.